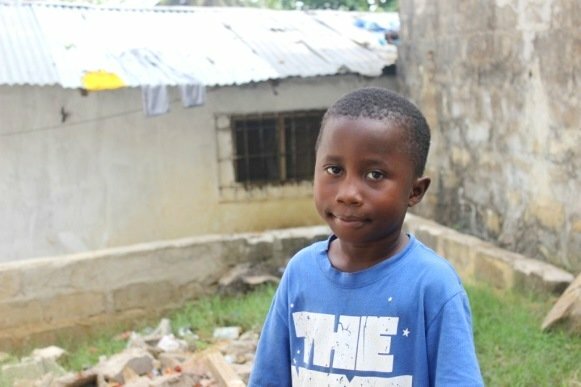 The Ebola outbreak in West Africa caused devastation to the lives of children, many of whom like Jesse (6) lost parents and other primary carers. 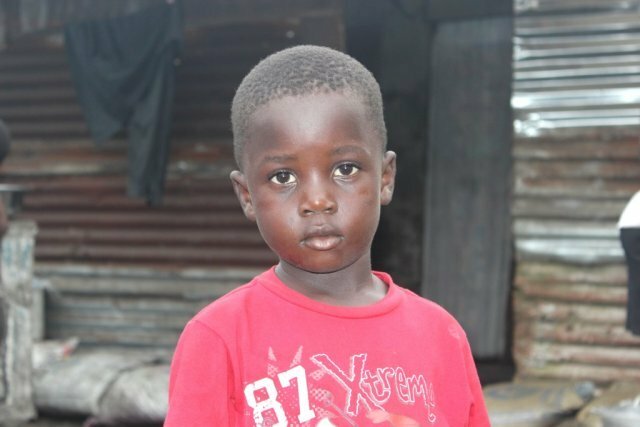 ChildFund is working on the ground with its local partners in Liberia to ensure kids like Jesse receive the care they desperately need. In Liberia, the last Ebola patient was recently discharged from a treatment facility, and children from ChildFund-supported ICC’s (Interim Care Center’s) are returning to their communities too. Tragically, many have lost loved ones, including parents and primary carers. They have a hard road ahead as they look to rebuild their lives. ChildFund’s national office in Liberia is keeping close contact with these children and their caretakers to see that children receive the care they need. Social workers now conduct regular visits to the homes of all children who stayed at the the Kelekula ICC to find out how they are coping with the loss of their loved ones and how they are getting along with their caregivers. ChildFund also distributes packages of clothes, mattresses, school materials, footwear, toiletries and food items like rice and oil, to each child while reuniting them with their caregivers. ChildFund is receiving updates on children like Jesse who were at the KeleKula Interim Care Centre, a place which served some 55 children who lost caregivers during the outbreak. The centres provided children with a safe place to spend their 21-day quarantine period after exposure to the virus. Afterwards, staff at the centres coordinated closely with government officials to help place children with relatives or in stable foster care situations. Three of these kids have lost family members to the deadly virus but are managing to move forward in their lives. These are their stories..
Six year old Jesse (above) is currently living with family friends after losing his mother and grandparents to the virus. At the Interim care Centre in Kelekula he liked playing with friends. They rode the swings and the merry-go-round and played football in the compound. Jesse enjoyed the food they served each day. He has since been reunited with family friends who live in Monrovia, Liberia’s capital. “I am happy with the people I am living with now,” Jesse says. Ebola claimed six year old Zinnah’s parents and four siblings. Zinnah (seen above) is currently being cared for by a teacher, Mr. Brown. “We used to ride see-saw,” he says of his time at the Kelekula ICC, where he also learned about preventing Ebola, how to read and other basic life skills. Both Zinnah and his guardian are looking forward to the reopening of his school, and in the meantime, he plays with friends and often takes a leading role in their activities. Jestina lost her mother and grandparents to Ebola, but thankfully her father survived. He sells cabbage to make a living and they live in Liberia’s capital city Monrovia. 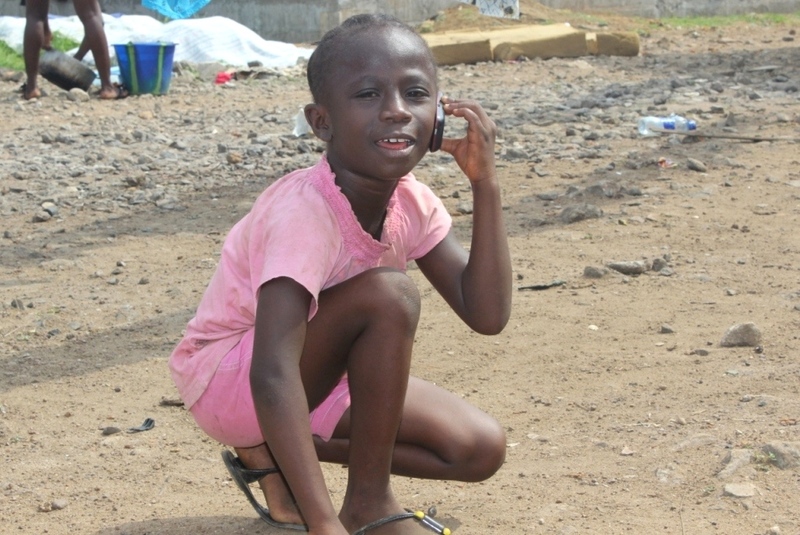 Jestina (pictured here talking with her father on the phone) liked living at the ICC in Kelekula. There she had the opportunity to play with other children and also learn about preventing the virus. She is hopeful that one day she will be a banker. “I want to be a money girl,” she says. Jestina loves to write and read, and she wants to see that all children are happy and free from dangerous illnesses like Ebola. Her father says that she seems happier lately and plays with her friends frequently. Please support ChildFund in our work to protect and providing for the worlds most vulnerable children. Your patronage can make a hugely significant contribution to their future . Read about our child sponsorship programme here and find out how you can get involved.